Intel has announced its latest generation Core i3, i5 and i7 processor, promising that they will offer "the biggest improvement in battery life in Intel history" compared to their predecessors. Like rival AMD, Intel believes that thin and light laptops will give way to hybrid Windows 8 devices that combine touch, keyboards and a convertible form factor that will see them either used as tablets or conventional laptops. Intel's logic is that even larger laptops are moving towards thin and light designs, while there will be a bigger demand for touch PCs in future. Intel is calling these chips "4th generation" and in Intel's tick-tock parlance, this is a tock (formerly codenamed Haswell) that succeeds Ivy Bridge, which also had a 22nm manufacturing process. There are 1.4 billion transistors on the quad-core die, which measures 177mm2. Comparing a 2012 Core i7-3667U (20W TDP) laptop chip with a new generation i7-4650U (15W TDP), Intel cites up to three hours of extra battery life (6 vs 9.1 hours) during HD video playback, and a two hour improvement (6.1 vs 8.3 hours) in MobileMark 2012. Standby is up from 4.5 days to 10-13 days. Obviously we should take these figures with a pinch of salt, but there should be some interesting improvements in test figures for laptops. Intel is also claiming a 2x improvement in the graphics capability of the new chip's HD 5000 graphics cores vs the previous HD 4000 generation. Last month Intel has also announced two extra levels of graphics for more professional use, called Iris and Iris Pro, numbered as HD 5100 and HD 5200 respectively. 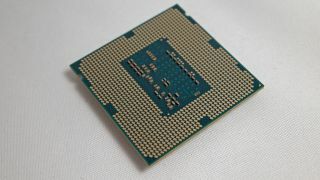 We'll have a review of the latest generation CPU in the coming days for you on TechRadar.